Rock & Tait has been a premier home remodeling firm in the Chippewa Valley for years. While the business has consistently seen success, in recent years the perception of the previous logo and website were no longer in alignment with the family and community focused brand Rock & Tait was working to become. They needed to reposition themselves as the "whole-home improvement" brand in the region, and in doing so were hoping to make their brand more appealing to their core market, attracting business on more than just price. 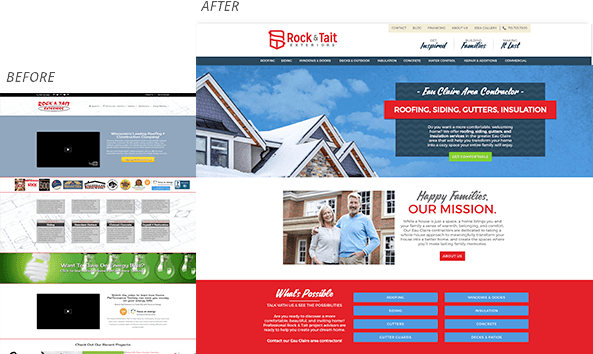 Rock & Tait contacted Satellite Six looking for a reliable, ongoing marketing partner to build their brand, messaging, and identity, and to work with them in generating new lead opportunities and changing the brand perceptions from rough and gritty to more in-line to the needs of their homeowner clientele. Immediately after engaging Satellite Six, a survey was implemented to understand the perceptions of Rock & Tait. It was discovered that several key assumptions held by Rock & Tait about their customer base, including demographic age and perceptions of their brand, were incorrect. Armed with this survey data, Satellite Six developed a brand marketing plan to develop and release a new brand over the following 12 months. This included rolling out new messaging (“Improving Homes. Building Families”) and visual identity to be seen as a community and family-centric brand. In developing the visual identity, great care was taken to consider the age and interest demographic of the ideal customer base. Rather than targeting a 30-45 year old cohort, the brand was aged up a bit to instead target more directly the 45-60 year old groups who would be improving their homes for visiting and returning family members. A larger focus was placed on showing multi-generational families, and in remodeling the space to suit the changing needs of a gathering space, rather than just a vanity project. 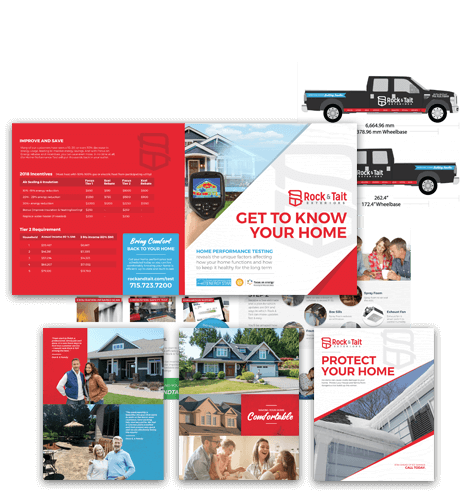 New materials were developed, from logo to brochures to sales kits, truck trailers, sales flyers, and more, with these communication goals in mind. Following the success of the brand rollout, a new website was completed and launched, with a greater focus on inspiration and idea generation rather than straightforward sales. This strategy, as well as an updated page flow, resulted in tremendous boosts to the site’s performance over the first 3 months following launch, generating an average of 30 leads per month, up from near none on their previous website. Satellite Six also developed inbound strategy including Facebook, blogging, and organic SEO, helping Rock & Tait to rank highly for their top valued terms over most of 2018.